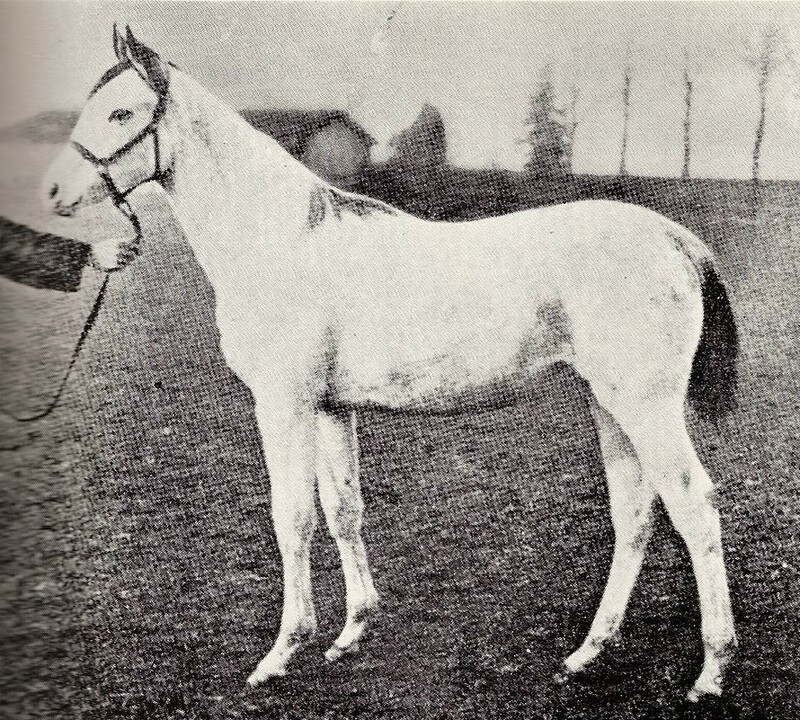 For a long time, the sabino-like pinto patterning of loudly marked Thoroughbreds was logically thought to be the result of the sabino allele (Sb1), but we now know that Sb1 has not been found in Thoroughbreds, and the white patterning is actually the result of a family of mutations known as white spotting (W). 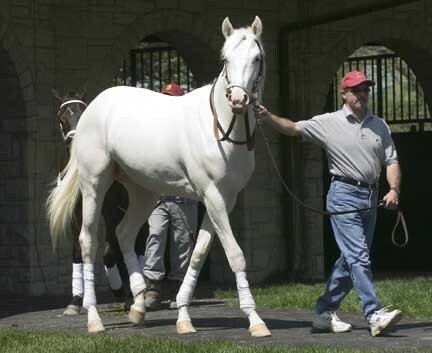 At least 6 white spotting (formerly called dominant white) mutations are present in the Thoroughbred gene pool, and it's very likely that more will be discovered. It is the result of a spontaneous mutation of the KIT-gene which is why white foals tend to be a surprise when born to solid parents. Because this is a dominant gene, once the pattern is present, it will be passed on about 50% of the time. The pattern is thought to be lethal in utero in homozygous form although horses may be heterozygous for 2 different W-alleles. For example, W2W2 is likely lethal in utero, but W2W5 is perfectly viable. White spotting ranges in expression depending on the mutation. Some families consistently produce all white or nearly all white horses while others produce partly white horses that are a mix of their base color and white. At least one dominant white mutation, W20, is thought to produce "ordinary" white markings such as blazes and socks. It has been confirmed in Thoroughbreds, and when combined with other pinto patterns, including other white spotting genes, it boosts the amount of white in a horse's coat. 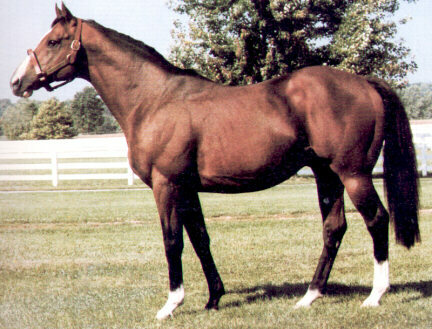 The great sire Northern Dancer is probably an example of W20. He and his offspring tend to produce horses with big blazes and socks. The White Fox from the W2 family which has consistently produced all white horses. 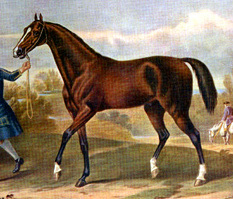 Known white spotting mutations in the Thoroughbred include: W2 - KY Colonel (White Beauty, Patchen Beauty, The White Fox, etc); W5 - Puchilingui (Sato, Chet D T, Puchi Trap, etc); W6 (unidentified, possibly Marumatsu Live); W7 (unidentified, possiblt Turf Club); W12 (unidentified); and W14 - Shirayukihime (Yukichan, White Vessel, Marble Cake, etc). Many other white Thoroughbreds exist outside these families, so I'm sure their W-mutations will be identified in time. The pattern is likely as old the breed though few examples of loudly marked horses are known until the late 19th century. Given that many "crop out" dominant white horses were not registered even in the 20th century, it's not surprising that they may have been shunned in earlier centuries when prejudice against odd colors was stronger. 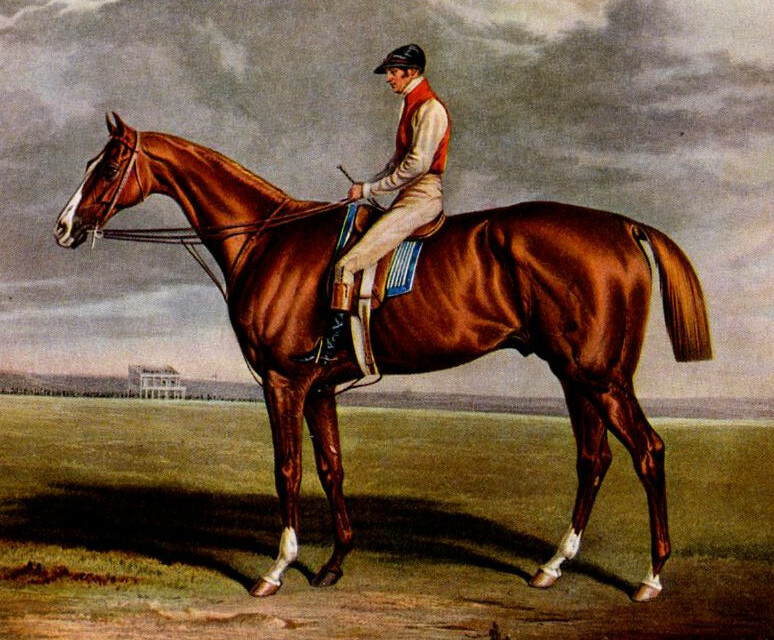 The horse in the painting at left is from a much larger landscape entitled "Racehorses of King George III" that hangs in the Walker Art Gallery in Liverpool, England. 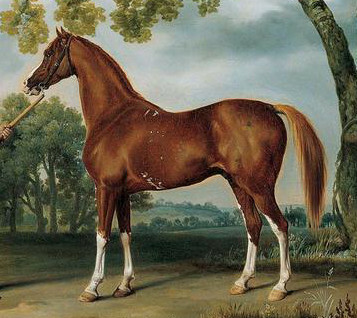 It has been mistakenly identified as a painting of "King of Trumps" by Stubbs from 1790 in various places, but the gallery has confirmed that that is not the title of the piece and that it likely dates to the early 1800s rather than the late 1700s. Also, no such horse is known from that period. 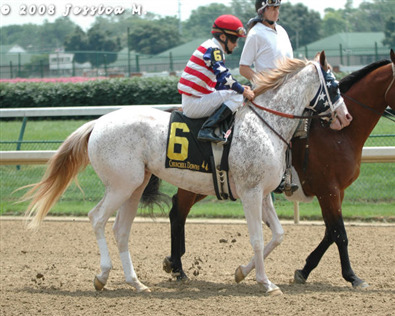 Nonetheless, it does show a racehorse from an early point in the breed's history that appears to be white spotted. 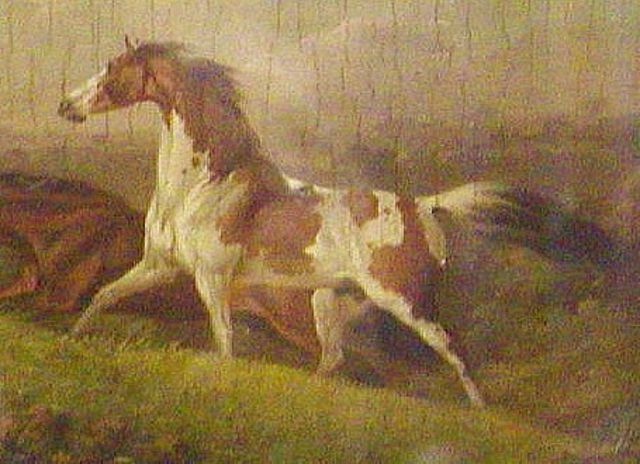 Other examples of horses with normal but loud markings date to the very foundation of the breed such as the White-Legged Lowther Barb (late 1600s), Warren's Careless (born 1751, blaze and tall socks), Quiz (1798, broad blaze, socks), amd many others. Some of this white patterning undoubtedly came from the various Arabian stallions imported in the 1600s and 1700s. 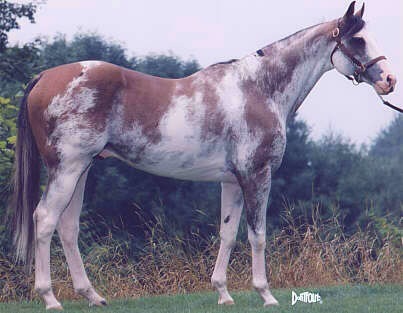 The first registered white spotted Thoroughbred known is White Cross, a Tennessee-bred horse foaled in 1896. A handful of others followed over the next half-century, but the earliest photograph of a white spotted TB I know of is that at right of Woher, a 1925 German-bred filly by Pergolese out of Lonja (by Majestic).